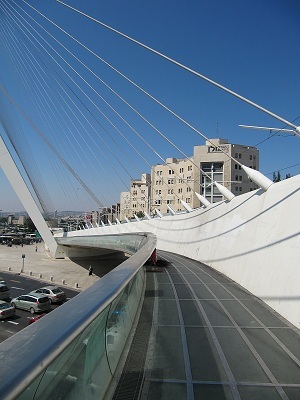 I’m a bit confused about what it’s supposed to be called in English, but it stands at the main entrance to Jerusalem, was inaugurated in 2008 and is now used by pedestrians and the light railway. I’m not sure it suits the character of Jerusalem, but it is impressive and was apparently the only suitable option for the light railway. great photo!! keep them coming. It sure does look impressive! Wow, that’s seriously beautiful! Great post and happy A-Z blogging. The Dormition Abbey (not the Chord Bridge)? Jerusalem. Interesting Theme, and good posts. I’ll be back.